Beveridge & Diamond welcomes Stacey Halliday, former U.S. Environmental Protection Agency (EPA) Special Counsel, back to our Washington, DC, office as an Associate. Stacey first joined B&D as an associate in 2012 and joined EPA’s Office of the General Counsel in 2015. Assisting agency leadership with accomplishing several internal initiatives, including the launch of the agency’s Sexual Orientation and Gender Identity (SOGI) Data Collection Pilot, where EPA became one of the first federal agencies to expand the collection of workforce demographic data to include SOGI criteria. Stacey’s prior work at B&D included representing a large municipal water utility in a variety of matters, including the successful negotiation of regional agreements, defense of the utility in complex civil litigation, and consultation regarding regulatory obligations. 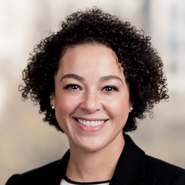 During her time at B&D, Stacey served as Chair of the American Bar Association's Special Committee on Environmental Justice, and will contiue to hold a leadership role on the Committee. Following graduation from the Howard University School of Law, Stacey was a judicial law clerk for the Honorable Anna Blackburne-Rigsby in the District of Columbia Court of Appeals. Before law school, Stacey was a litigation paralegal with a large law firm in New York. She received her undergraduate degree from Harvard College in 2005, concentrating in political science.